In case you are living under a rock (I got an email, saw it on blogs AND Facebook), Starbucks is having a big promotion for the release of their "create your own" frappuccinos. I've always been a big frapp fan, particularly in summer. My drink of choice is the mocha light frapp. We'll see if they have low-cal options with this create your own program! 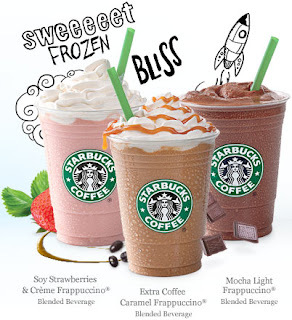 Between May 7 and 16, enjoy a half price Frappuccino blended beverage at participating Starbucks between 3-5PM. Since I'm a lady of leisure this week (no work until Monday!!) I'm headed there on Friday for sure!